This is the Mens League opening day and is a great opportunity to meet the other league players, and enjoy a great day of golf filled with food, drink and fabulous prizes. The $ 88.00 entry fee covers your green fees, food after your round and great prizes. ENTRY DEADLINE IS SUNDAY APRIL 29th, 2019. Sign up early to avoid disappointment !! The weekly play gives you an opportunity to enjoy the companionship of your golfing friends, or grow your golfing friends as well as the chance to win a few prizes along the way.Each week there will be a variety of hole prizes awarded as well as Net and Gross score pizes. The Sunday Mens Golf League play is accompanied by a montly "FUN DAY" including the ever popular "Beat the Pro" day ! After your round be sure to Venture upstairs to Mulligans to share in some camaraderie with your fellow league members and enjoy the specials the restaurant staff will have put together for you ! 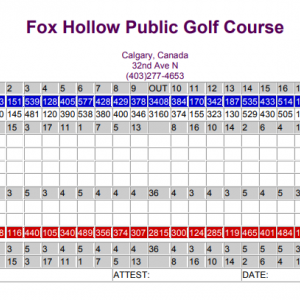 As always the season has to come to an end, we will draw the groups up, and conclude the day with a wonderful meal and drinks as well as our Famous Fox Hollow Prize Extravaganza for teams as well as draw prizes unheard of !! Entry Deadline is Sept 17th, 2019. This is a Can't Miss Event ! !